Daniel F. Galouye was born on this date in 1920. He was reasonably prolific in the magazines from 1952 until the mid 60s. He wrote only 5 novels, at least two of which are very well worth reading (Hugo nominee Dark Universe, and Simulacron-3 (aka Counterfeit World), which was the basis of the rather good movie The Thirteenth Floor.) He had war injuries (he was a test pilot) that curtailed his production and probably contributed to his early death in 1976. I find his work often original and enjoyable, if decidedly uneven. Much of it was published in what were considered second tier magazines -- particularly Imagination in the '50s, and Amazing/Fantastic in the '60s; and he is one of the reasons I have a considerable fondness for those two magazines. These are a number of reviews I did of his short stories for my "Retro-Reviews" of old magazines, along with my blog post about my favorite of his novels, Simulacron-3. Finally, Daniel F. Galouye's "Jebbaburba" (5000 words) is about an alien diplomat's son, who has the ability to teleport anywhere, much to the disconcertment of the neighborhood women. The story goes on about efforts to make him stop -- with a slightly unexpected result when he is finally stopped. Pretty minor stuff, not Galouye anywhere near his more interesting peak. Daniel F. Galouye's "Soft Touch" (6000 words) is about a beneficial mutation that produces "Quids", exceptionally moral people who cannot stop themselves from helping others when asked. The hero, despite being poor, is victimized by a co-worker who cadges loans from him, and eventually is manipulated into confessing the other guy's embezzlement. "Quids" are hated by normals, and he is at risk of being beat up and driven out of town, along with his non-prejudiced normal wife, but then a (rather deus-ex-machina like) solution is offered. Minor work. Galouye's "Kangaroo Court" is a decent look at the problem of crime in a fully telepathic society. A space miner wakes up from a drunk and finds his partner dead, obviously murdered, in their locked spaceship. Logically, he should be guilty but he has no memory of killing the man, a good friend. There is a plausible motive: they've just made a huge strike. The telepathic society immediately "hears" his thoughts and "convicts" him of murder, and is ready to force him to kill himself, but a sort of ruling body intervenes and insists that there is no absolute proof. The man's brother, a successful psychiatrist, with whom he's had a rocky relationship, offers to help ... Of course, he's not really guilty -- but if anyone else had done it, they would be telepathically "admitting" guilt. (It is presumed that the intoxicated state of the protagonist led him to forget.) Galouye's way around this problem is a bit strained, but it has its interesting aspects. An OK story, not a great one. "Mirror Image" reminds me of the Borges bit about creatures that live in mirrors (the source material for Mieville's "The Tain"). A scientist becomes convinced that mirrors are a link to another dimension, similar but not identical to ours, and he proves it by creating a device to amplify the differences. But of course he is regarded as insane. The whole thing just seemed strained to me. "A Silence of Wings" is a somewhat more typical story, and, like much that appeared in Fantastic in those days, it's Science Fiction, though with a central idea that is kind of on the Fantasy side. Humans have come to a new world that they want to bring into their interstellar confederation, to be a productive culture. The problem is, the intelligent species on this world, the Soarers, has no interest in productivity. They just fly, and they have enough to eat, and are same from the local predators mostly. The story is told through a Soarer's POV, and a human's. The human is depressed at the notion that the peaceful Soarers will have their society disturbed, through this boss's action. The story turns on the fact that it's physically impossible for the Soarers to fly -- they are humanoid, of fairly normal size, and their wings are fairy-like, gossamer. They fly only because they believe they can, but they are intelligent, so if they are told its impossible, they'll stop. Which is what happens. (I found that an interesting but multiply imlausible notion.) This leads to disaster, for the Soarers but also the humans, and our human hero must come up with a ploy to restore the Soarers' belief in their powers. I tend to enjoy Galouye's work, but this is a mixed bag, with elements of interest but not really working. "Mindmate" is the story of a crusading congressman, Ronald Winston, who is kidnapped and killed, after having his mind impressed on that of Warren Sharp, a lookalike criminal who will do the bidding of Leonard Infeld, the head of the so-called "Fun Houses", where a process called cortical stimulation provides a sort of virtual entertainment. Winston is convinced the process is dangerous and addictive, and he's leading a congressional investigation. Meanwhile, his wife has been secretely visiting funhouses, and his hostility to them has messed up their marriage. Sharp as Winston is supposed to stop the investigation, but he finds himself somehow having unexpected thoughts -- apparently those of Winston. (He also forces himself on Winston's wife, or so it is implied.) The story turns on that process (the way the impressed mind can take over the host mind), as well as on a couple of twists, concerning Winston's wife and her unexpected pregnancy, and concerning some truly sinister potential uses of the cortical stimulation process. It doesn't make a ton of sense if examined too closely, but it's still an effective and enjoyable piece. 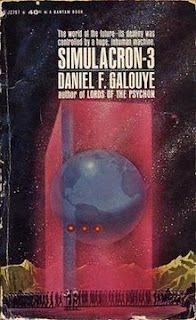 Daniel F. Galouye's Simulacron-3 gained some notoriety a few years ago when a movie was made based on it -- The Thirteenth Floor. I haven't seen the movie, though it got some modestly approving reviews. [I did later see it, and liked it quite a bit.] It came out at roughly the same time as The Matrix and as a movie I liked much more, Dark City, and it shared some of the same themes. The story opens with Doug Hall attending a party given by his boss, Walter Siskin. Hall has just been promoted to replace his dead friend and mentor at Reactions, Inc., which is developing a new simulation to evaluate consumer reactions. The simulation is populated by virtual people who are exposed to advertisements and such, their reactions analyzed. Siskin sinisterly wishes to use this simulation for political purposes -- he believes that he will be able to control the country if he can predict voter response to various approaches. Siskin is opposed by the Reaction Monitors group -- a seemingly ubiquitous group of pollsters, who will be put out of business by the new sim. Hall is made uneasy by Siskin's political ambitions, himself. Then Hall starts to notice some strange things. His mentor's notes contained what appeared to be a cryptic message to him, which disappeared. He remembers some other colleagues that nobody else can recall in any way. A psychiatrist friend thinks he's mad. His mentor's beautiful daughter seems to run hot and cold with him -- and to be very concerned about his crazy ideas. And what about the time they drove out of the city and all of a sudden the road just stopped with nothing beyond? It's no big surprise what's going on, even if the back of the edition I have didn't give it away, and even without the references I've given to Dark City and The Matrix. Hall and all the people he knows are themselves virtual creations in a simulated world. Much of the resistance to his simulation efforts is orchestrated from the "real world" (or is it? ), which doesn't want to lose its Reaction Monitors, the real reason for the simulation. Hall finds himself traveling "down" to his simulated world, and encountering (sometimes sadistic) evidence of someone from the "real" world taking over his brain. It's mostly pretty well handled, and the questions raised are interesting. The resolution is perhaps just a bit too convenient, too much fulfilling of wishes. The characters are mostly fairly stock. Still, a fine story. Thank you for a great review and for remembering both Galouye and Goldsmith!